Aasiwins.com handicapper Joe D’Amico breaks down Week 14 of the 2018 NFL season. Analysis: Kansas City’s No. 1 scoring offense goes up against Baltimore’s No. 1 scoring defense. Facing a stingy Ravens defense without a proven running back is going to be a much tougher task for the Chiefs than last week’s matchup against Oakland. Baltimore coach John Harbaugh said he might use Joe Flacco and Lamar Jackson at QB. Flacco can exploit the Chiefs’ NFL-worst pass defense, and Jackson and RB Gus Edwards can exploit Kansas City’s No. 22 run defense. But in the end, Patrick Mahomes and company should eke out a win. By the numbers: Baltimore is on a 5-2 against the spread run in December. Analysis: Houston edged Indianapolis 37-34 in overtime to start its nine-game win streak. The Texans can lock up the AFC South with a win, but the Colts are desperate after being blanked 6-0 last week by the Jaguars. Look for QB Andrew Luck to bounce back and have a strong outing against Houston’s No. 18 pass defense. 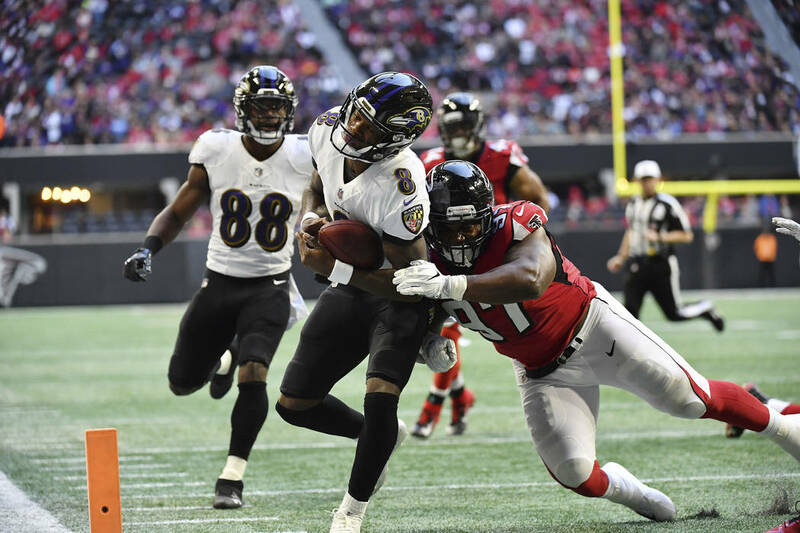 The rapidly improving Colts defense is going to be much tougher than Deshaun Watson and company have faced the past several weeks. By the numbers: The Colts are on a 4-0-1 ATS streak in Houston. … The Texans are on a 1-7 ATS slide in December. Analysis: After four consecutive losses, Carolina coach Ron Rivera is on the hot seat. On the other side, Browns coach Gregg Williams is 2-2 since taking over in Cleveland. The Panthers are 1-5 on the road SU and ATS. Baker Mayfield, Nick Chubb and Jarvis Landry are going to treat their loyal fans to a win at home. By the numbers: Carolina is on an 0-4 spread skid overall and is 2-5 ATS in its past seven games in December. Analysis: Two preseason NFC favorites have eight combined wins. The Packers are banged up on both sides of the ball and are dealing with a new coach for the first time in 13 years. Atlanta has won the past three meetings and has more weapons. Pride and playing at Lambeau Field will give Green Bay the win but not by much. By the numbers: The road team is 9-3 ATS in the past 12 meetings. … Atlanta has covered the past five meetings in Green Bay. Analysis: Tampa Bay has won and covered the past two meetings, including a 48-40 victory in the season opener at New Orleans. The Saints are coming off their first loss since then and have had extra time to rest and prepare. But the Bucs have the NFL’s top passing attack, and the Saints rank No. 30 against the pass. Jameis Winston hasn’t turned the ball over in the past two games, both wins and covers, and Tampa Bay’s defense has tightened. By the numbers: The home team is 4-1 ATS in the past five meetings. … New Orleans is on a 1-4 spread skid in Tampa. Analysis: The Bills are favored for the first time this season. Rookie quarterbacks Sam Darnold and Josh Allen will square off in a matchup of two of the NFL’s worst offenses. Buffalo averages 14.8 ppg and New York 20.2 ppg. But both defenses have played well. By the numbers: The under is 5-2 in the past seven meetings in Buffalo and 4-1 in the Jets’ last five games vs. the AFC East. Analysis: Don’t put any stock into the fact that the Dolphins have given New England trouble in Miami over the years. This is Bill Belichick and Tom Brady in December. The Patriots can lock up a record 10th straight division title with a win and are one game behind the Chiefs for the AFC’s best record. New England routed the Dolphins 38-7 in September for their fourth win and cover in the past five meetings. By the numbers: New England is riding a 17-6 ATS run on the road and 37-15-2 cover streak overall. Analysis: A quick glance would have us taking Washington all the way here. But seeing that the Redskins have run out of able-bodied QBs and must start Mark Sanchez raises doubt. But RB Adrian Peterson is starting to hit his stride. A heavy dose of him will keep the Giants’ defense honest and allow Sanchez to connect with his receivers. You can expect a letdown from a New York team coming off a 30-27 upset of Chicago. By the numbers: The underdog is 11-5 ATS in the past 16 meetings. … The Redskins are on a 4-1 ATS run at home. Analysis: In four starts, Nick Mullens has gone from a hero to a punch line. After throwing three TD passes in a blowout win over Oakland in his debut, the QB has thrown for two TDs and five interceptions in a three-game losing streak SU and ATS. Mullens faces a vastly improved Denver defense led by pass rushers Von Miller and Bradley Chubb. The Broncos are riding a three-game win and cover streak that has put them in the AFC wild-card race. QB Case Keenum can rely on RB Phillip Lindsay to keep the 49ers’ defense off balance and open up the passing game. By the numbers: Denver is on a 4-0 ATS run on the road and 6-1 cover streak overall. … San Francisco is on a 1-4 ATS skid at home and 1-5 spread slide overall. Analysis: No smart bettor will tell you to play the Bengals, who have lost four in a row and six of seven and are without their starting QB (Andy Dalton) and one of the NFL’s best WRs (A.J. Green). Los Angeles overcome a 16-point deficit last week to beat Pittsburgh at Heinz Field. Philip Rivers will shred Cincinnati’s No. 31 pass defense, and the Bengals have the NFL’s worst run defense. By the numbers: Cincinnati is on a 1-6 ATS slide. … The Chargers have covered four of their past five games. Analysis: Can you say letdown? Last week, Arizona upset Green Bay 20-17 at Lambeau Field as a 13½-point underdog. But the Cardinals still have the NFL’s worst offense. Detroit has a consistent QB in Matthew Stafford, and even if RB Kerryon Johnson misses his third straight game, LeGarrette Blount is a capable replacement. By the numbers: Detroit is on a 7-1-1 cover streak against teams with a losing record. Analysis: Four straight wins and covers have Dallas going from the NFC least to the NFC beast. Ezekiel Elliott will give Dak Prescott time to pick apart the Eagles’ No. 26 pass defense and connect with his new favorite target, Amari Cooper. Philadelphia has had issues scoring all season and faces the NFL’s No. 2 scoring defense (18.6 ppg). By the numbers: Philadelphia is on a 3-8 ATS slide. … Dallas is on a 6-1 cover run against the NFC East. Analysis: Normally, I wouldn’t lay double digits with Pittsburgh here, especially with New England on deck. It just blew a 16-point halftime lead in last week’s 33-30 loss to the Chargers, and RB James Conner is out. But playing Oakland trumps all that. Look for the Steelers to bounce back with a vengeance. Oakland’s 40-33 loss to the Chiefs was the only defeat in its last seven losses by fewer than 14 points. Ben Roethlisberger is going to do most of the damage against a Raiders’ defense that hasn’t stopped any proficient passer. By the numbers: Pittsburgh is on a 6-1 ATS uptick after a SU loss. … Oakland is on a 2-6 spread skid at home. Analysis: Los Angeles has clinched the NFC West and is looking to stay ahead of the Saints for home-field advantage in the playoffs. The 1-2 punch of QB Jared Goff and RB Todd Gurley can light up any defense. The only elite QBs Chicago faced this season were Aaron Rodgers and Tom Brady, who combined for 573 yards passing and six TDs while dealing the Bears two losses. Mitchell Trubisky will start, but the QB does not have the arsenal to contend here. By the numbers: The Rams are No. 2 in total offense and tied for second in the NFL in scoring (34.9 ppg) with the Saints. Analysis: Seattle is on a three-game win streak but has a one-dimensional offense. The Seahawks have the NFL’s No. 1 rushing unit, but pose no aerial threat. Minnesota is a far cry from the team it was a year ago, but it still has a nasty defense and ranks No. 7 against the run. QB Kirk Cousins can throw the ball and has talented receivers. By the numbers: Minnesota is on a 19-8 ATS streak in December. … Seattle is on a 5-0-1 cover run vs. the NFC.